Brian Ive, a Development Executive at Tongaat Hulett Developments, said the wide variety of opportunities and holistic planning of both the Bridge City Town Centre and Business Estate provided for a wide range of business activities, including light industrial, medical, legal, commercial, retail and residential elements. In addition, the substantial additional footfall created through the establishment of Bridge City as one of the city’s largest inter modal transport facilities would open up numerous opportunities across these sectors. Already Bridge City is expected to be the second busiest transport interchange in the city, second only to Berea Road/Warwick Junction. The first phase of the Go Durban! integrated rapid public transport network (IRPTN) is expected to be completed in 2018 with Bridge City as the meeting point for three bus rapid transport corridors linking it to the Durban CBD, Pinetown and Umhlanga. Usage of the already operational Bridge City railway station, through which 22 trains pass daily, is expected to increase still further. Once all transport modes are fully operational, it is expected to service over 100 000 commuters daily. Ive pointed out that significant progress had been made on the first private development at Bridge city by independent property development company, Imabli Props 48. Construction began in late 2014 and the first phase is expected to be completed by December this year. Centrally located adjacent to the shopping mall, it is a mixed use development with a total lettable area of 5 500 m². It will include a musallah and a clinic as well as retail, commercial and residential space. Key tenants include a KFC Drive Through, a Lenmed Medical Clinic and a Check Star Supermarket. Ive said that that two sales had been concluded recently and that construction of these developments was due to begin during the first quarter of 2016. So far, half of the sites within the Bridge City Town Centre (30 hectares) have been sold whilst there are just four sites available in the 17 hectare Bridge City Business Estate. The Business Estate, too, is intended for mixed use. Sites vary in size from those suited to small companies needing smaller sites to larger sites for warehousing and light manufacturing. 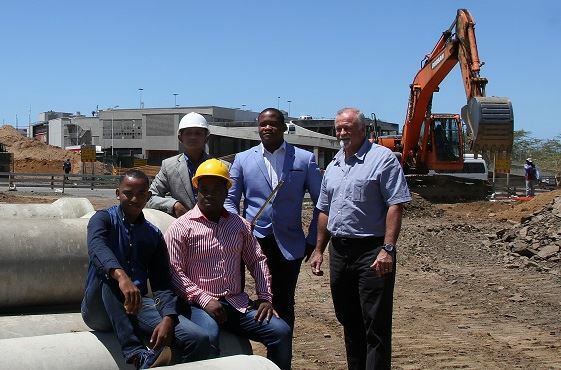 Bridge City is being developed as the second leg of the Effingham Development Joint Venture Public Private Sector Partnership between the eThekwini Municipality and Tongaat Hulett. The first was the highly successful Riverhorse Valley Business Estate. However, whilst the latter is primarily industrial with a single hospital, Bridge City is a mixed use development. He explained that Tongaat Hulett was reinforcing its commitment to creating meaningful stakeholder value through the growth and development of entrepreneurs such as HZ Investments which is headed by local entrepreneurs and property developers under the age of 23. Their first R650 million development, HZ Empire, begins with a R250-million first phase which includes a petrol filling station and a six floor mixed use development. It is located on a strategic site on the western edge at the entrance to Bridge City. Construction is expected to begin during the first quarter of 2016. The design review process is due to be concluded within the next two months and all major consultants have been appointed. The second phase will be located on an adjacent site, the purchase of which is underway. It is hoped to house a “government mall” - a government one stop shop that will include offices of strategic departments such as Home Affairs, the Department of Social Development and municipal electricity and water services. Negotiations are underway. “We come from KwaMashu, Ntuzuma and Inanda, so we know the needs of the community. Through the creation of a government mall, we want to cater for those who cannot travel far. We want to provide jobs and are looking at projects that will impact on the area. We want to see this place being elevated. That is one of our core visions,” says chief executive of HZ Investments, Wandile Zulu. Together with his colleagues Siyabonga Hlengwa, who is joint chief executive, chairman Bishop Qwabe and chief operating officer, Robert Phato, he established HZ Investments in 2013. The initial intention was to open a petrol filling station on the site. BP not only appointed and trained them to operate the petrol station, but assisted with funding the land purchase through paying all leases upfront and helping them expand their vision and take their development to the next level with the inclusion of the rest of the mixed use development. HZ Investments has already secured the correct zoning to operate the filling station on that location for the next 20 years. Application has been made to the Department of Energy for a licence to operate. This is expected in about six months. Tongaat Hulett Developments also stepped in to play a mentoring role, according to Ive. “Although many other professional developers had shown an interest in this prime site, we chose to work closely with HZ Investments for over two years, mentoring and assisting them to reach the position where they are now about to see their first development come out of the ground. One of our key drivers is to get local black developers to invest in Bridge City and we felt that there was a synergy between the vision of HZ Investments and that of Tongaat Hulett Developments,” he explained. He said he was looking forward to seeing other young investors and entrepreneurs gain traction at Bridge City. He also expects new entrants such as HZ Investments to continue to pursue opportunities. Already these entrepreneurs are looking at opening a factory to produce energy drinks at Bridge City and are having discussions with Pakhamile Madonsela, Regional Manager of the National Empowerment Fund in KZN concerning finance.